Nothing like waking up to the sound of gun shots. Hunting season started yesterday. How do we know? Believe me we’ve been told – the border patrol officer in the gas station wearing his bullet-proof vest because he doesn’t trust the local hunter’s shot, the father-son duo in AT&T planning the rest of their evening, or the numerous vehicles we passed carrying neon-orange clad passengers. All signs point to “Hunting Season Open”. Still 2,160 km to go but we have our priorities, and this morning those priorities include equal opportunity cup holders in the Yota. Nothing a trip to West Marine (Greg’s new favourite store, sorry Princess Auto) and a quick parking lot outfit can’t handle. Boom. 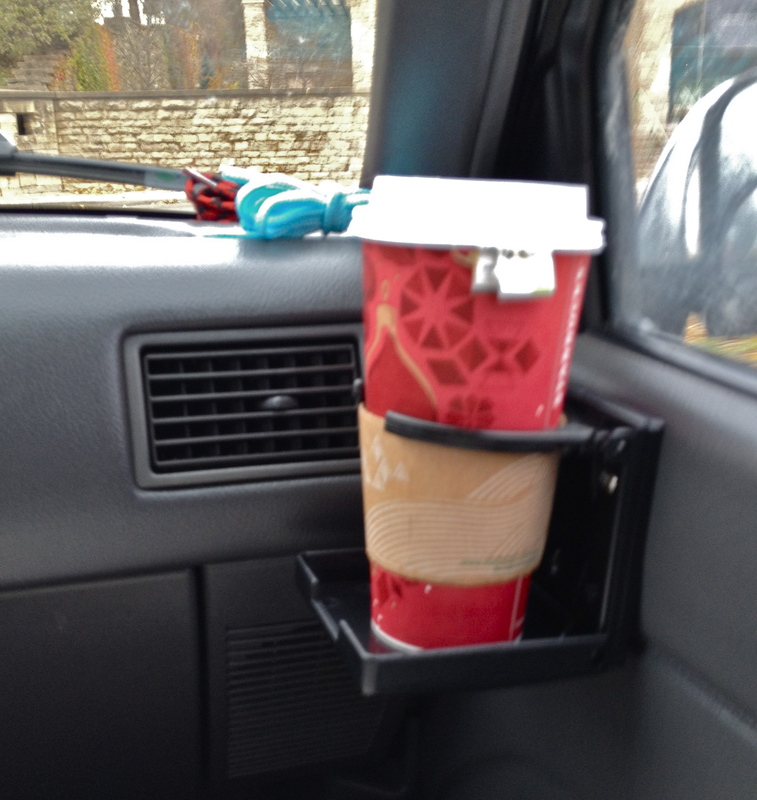 I’ve got a cup holder! Now I wrote that first bit first thing in the morning and was quite happy that that would be it. Greg had said something along the lines of “you know you don’t have to write a book or anything”. Well what happens next almost deserves to be a book, and we wouldn’t even need to include the part where I elected to drive through Chicago instead of go around as Greg had wanted. This caused a bit domestic stress and cost well over $25 in tolls. 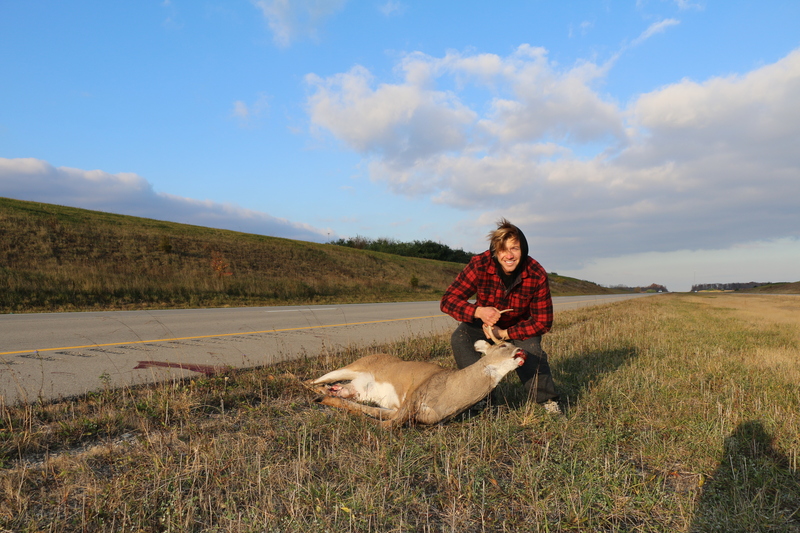 We were driving along Interstate 35 in Ohio in the dark and we hit a deer. 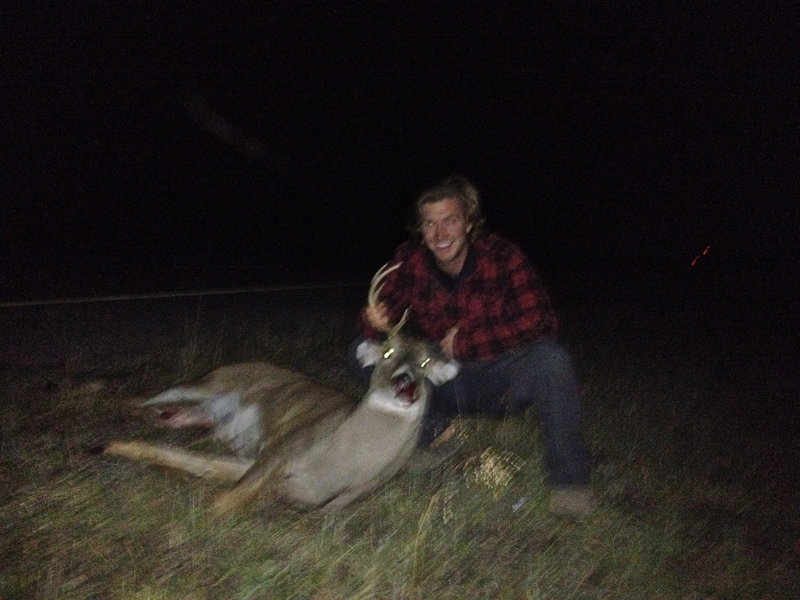 We bagged a buck. With the Yota. Yup, turns out the hunters didn’t get them all yet and this guy came out of nowhere. Greg tried to maintain control of the truck but something (the bumper) had locked the steering and we went veering out control. They say time slows down in situations like this. Greg says it was just a slow roll. 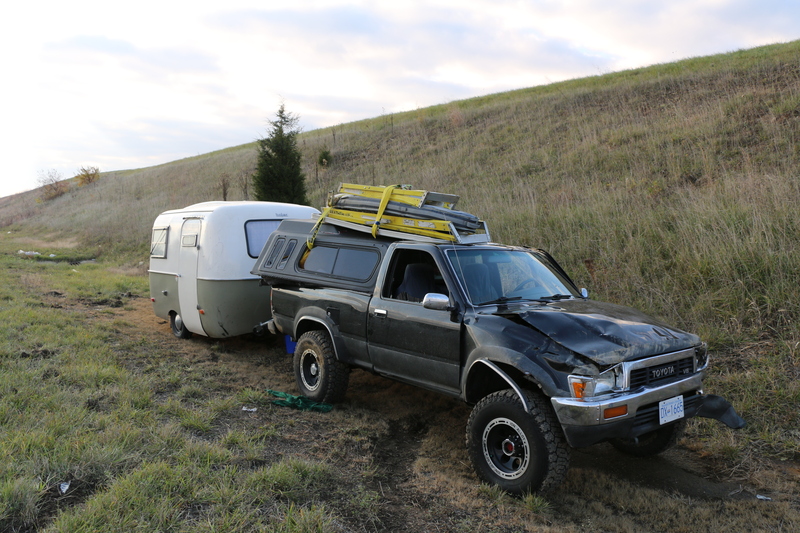 But that we did, we rolled the Yota. One complete barrel roll and we were back on our feet. I’d be lying if I said I didn’t go into shock. We did a quick survey of ourselves and each other and then miraculously both stepped out of the truck unscathed. To try and determine what was going through my mind at this moment is like trying to catch a single leaf in a tornado. How in the hell?! The poor Yota. Why didn’t we stop earlier? That was just like a roller coaster. Is this real life? The Boler. MY NEW CUP HOLDER! I’m slightly embarrassed to admit, but yes, I thought of my newly installed cup holder and what a waste it was that we had now deemed it unusable. Now, as I was having irrational, useless thoughts and literally walking in a circle kicking the ground, Greg was already troubleshooting and coming up with solutions to our new predicament. At some point I located my phone and turned on the flashlight. 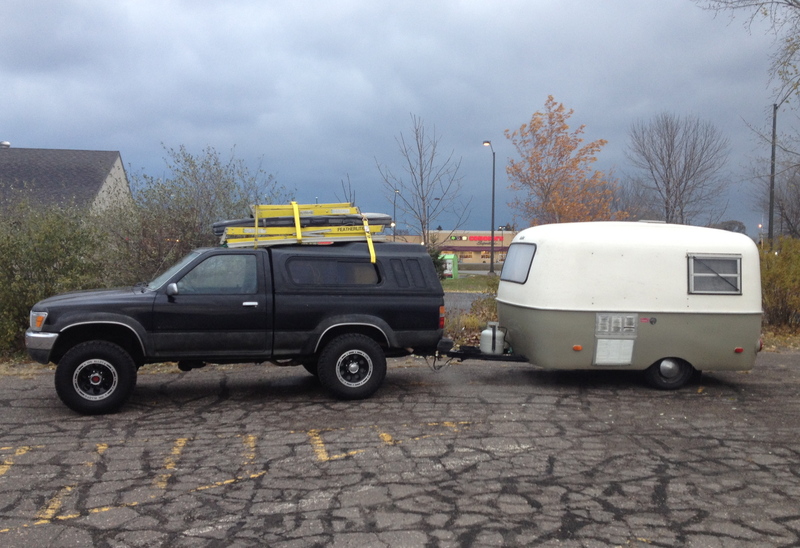 I seem to remember Greg and I both turning to the Boler at the same time and releasing a collective sigh of relief. There it was, sitting on both its wheels. Remember how your mom used to ask you, “Well if your friend jumped off a bridge would you too?”. Thank god the Boler didn’t jump off the bridge with the Yota. 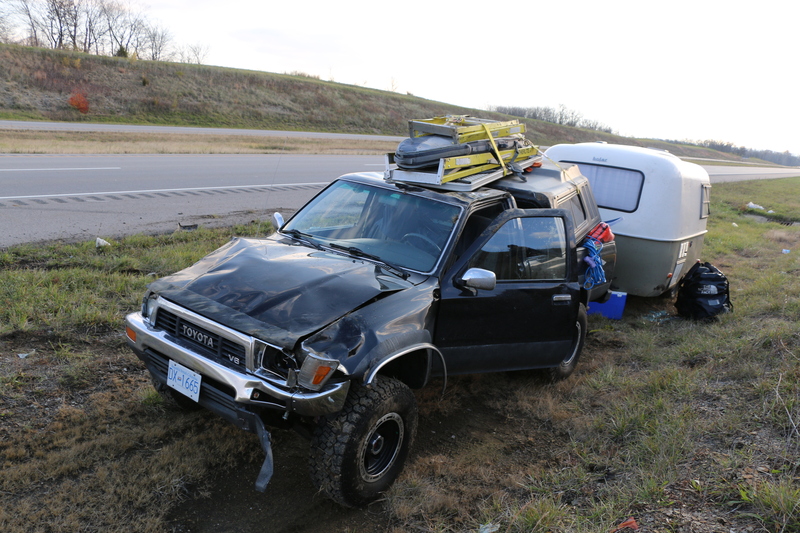 Besides a bent hitch and a couple black marks in the newly buffed exterior, the Boler also got away unscathed. Believe me, the inside didn’t look any worse for wear then after drive down a Northern Canadian highway. As we walked around picking up the pieces, our first Ohio State Trooper showed up. 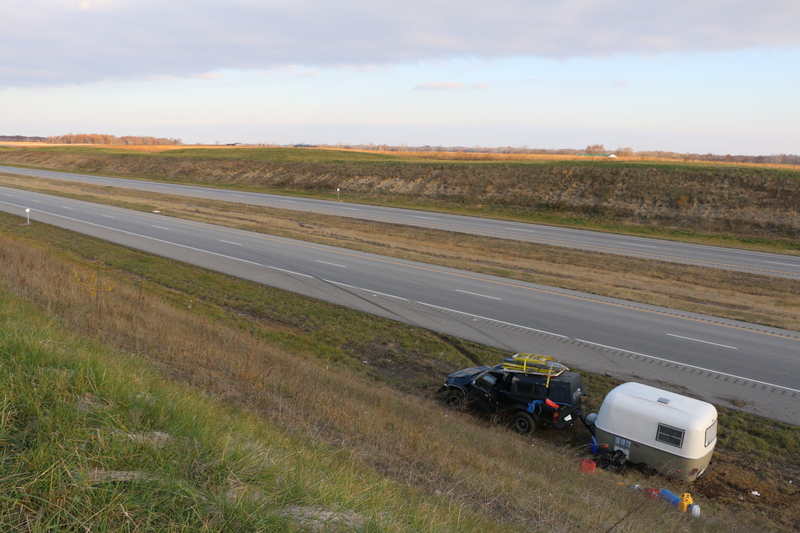 Shortly after I picked up Greg’s laptop, which had fallen out of the broken passenger window, our second State Trooper arrived. His baffled look and “How’d you manage that?” could only make us laugh. After a quick sobriety test we all got on to deciding what to do next. 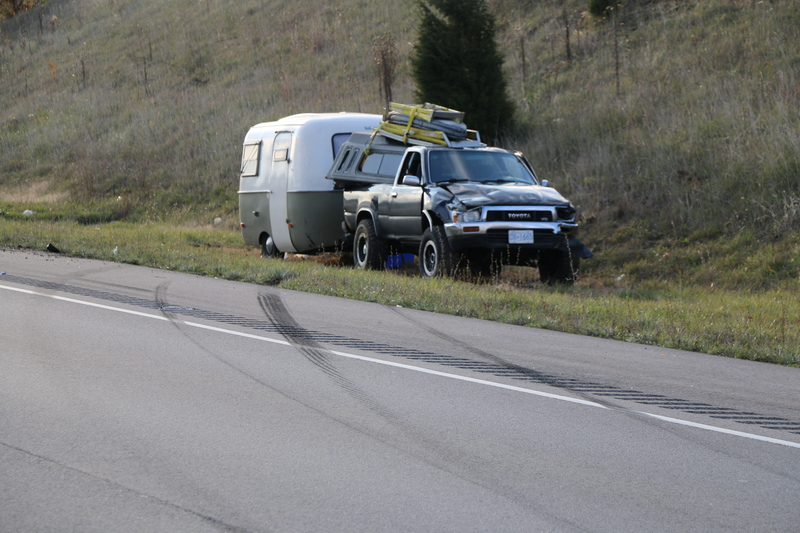 The State Troopers were adding up just how many tow trucks to call when Greg promptly put that idea to rest. A one too many encounters with crooked tow truck drivers has jaded Greg’s trust in the lot of them. 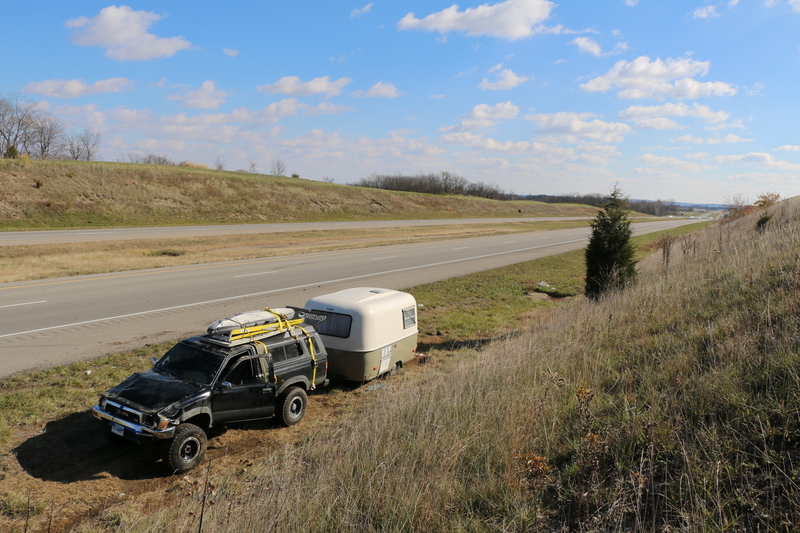 Plus, we literally had our lives in the truck and trailer, now scattered along the side of the interstate, we didn’t want to take the chance of anyone taking anything. So that we did. We straightened out the Boler, gathered up our belongings, and crawled into the Boler for a few hours of sleep. We lay in bed searching Toyota trucks and flat-bed trailers on Craigslist, totally unsure what the plan of attack would be when we woke up.